Oil spikes on tightening market conditions as OPEC snubs Trump's demand for lower prices. Saudi Oil Minister Al-Falih said that the kingdom expects to pump more oil in October and expressed readiness to increase output if demand continues to rise. However, oil prices are likely cheering the signs of tightening in the US market ahead of Iran's sanctions. For instance, U.S. commercial crude oil inventories are at their lowest level since early 2015 and the drilling activity has subdued recently. In other words, the market is convinced that major producers can not compensate Iran's output. 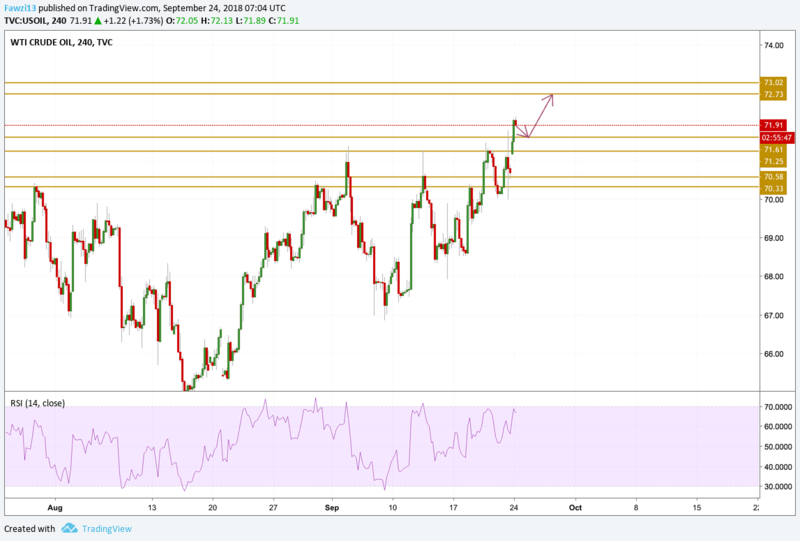 US oil prices found support above the $71 level and surged till reaching the $72 level for the first time since July 2018. Overbought conditions are not there yet, however a slight divergence between the price and the momentum has occurred as the RSI is pointing towards a small weakness while the prices are printing new highs. If the $71.5 support level can hold stand in the next few hours, then we will be focusing on the $73 resistance level.